At the beginning of November, two things happen without fail in my kitchen: I get my knives sharpen and I make an equipment purchase. The former should most likely be on your list as well: I’ve seen and used a lot of knives in a lot of home kitchens – they could benefit from a yearly sharpen. The latter is completely optional, but a great way to keep your kitchen equipment up to date and, if the opportunity presents itself, treat yourself. In years past, I’ve purchased roasting pans, replaced thermometers with better models, and upgraded some of my pots and pans. This year, I bought placemats and napkins in a cheery fall orange and got a decorative set of fall pie crust cutters for adding a little flourish to my Thanksgiving pie baking. A couple of years ago, I made a somewhat more unusual purchase when I came home with this chinois. Purchasing a chinois is far from practical, but if you are big into sauces and creamy soups it’s a must-have. Soups or sauces pushed through the fine mesh strainer on this conical tool transform into something ethereal. 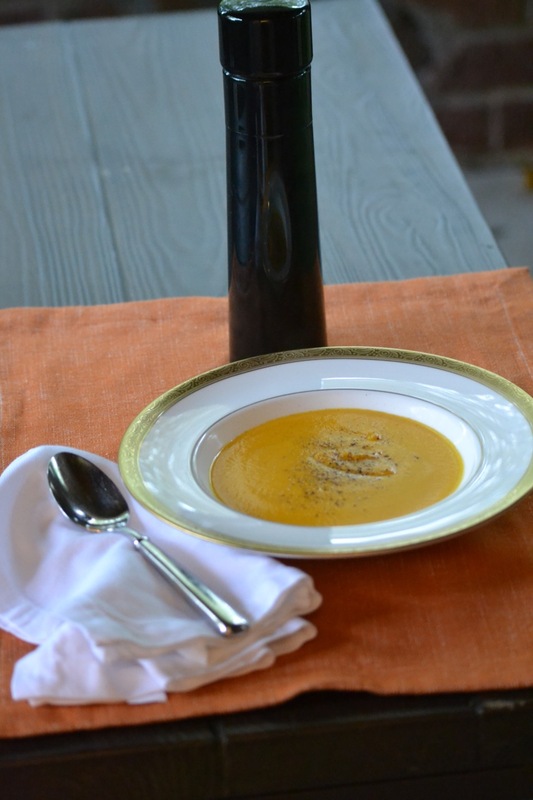 Yielding the most silky texture, it transforms even a humble soup, like this one of squash and sweet potato, into a dish worthy of the finest restaurant. It’s not something that you are going to use every day, but when looking to impress at your dinner table it’s the tool you’ll want to use. To be fair, even without a chinois you’ll want to make this soup. It is vibrant with color, has a creamy texture, and packs lots of flavor thanks to the mixture of winter squash, sweet potato, and exotic star anise. It’s a beautiful and delicious addition to your holiday table. Happy cooking! 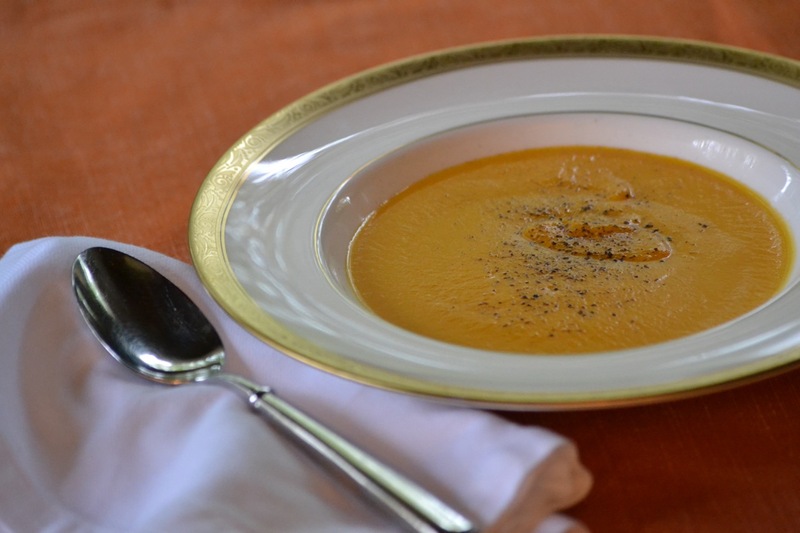 This soup calls for pie pumpkin (also known as sugar pumpkin). These pumpkins typically weigh around 1 ½ to 2 lbs and should not be confused with carving or ornamental pumpkins. Star anise, a truly beautiful spice, is found in most grocery stores, but is much cheaper when purchased at an Asian food market. Melt the butter in a large pot. Add the onion and cook, stirring often, until soft, about 4 to 6 minutes. Stir in the garlic and cook until fragrant, about 30 seconds. Add the butternut squash, pumpkin, sweet potato, carrot, star anise and bay leaf and stir to combine. Add the vermouth and cook for 1 minute. Add the chicken broth and bring the soup to a boil. Reduce the heat to a simmer and cook for 20 minutes or until the squash, pumpkin and sweet potato are tender. Remove the bay leaf and discard. Puree the soup in batches in a blender or purée in the pot using a hand-blender. 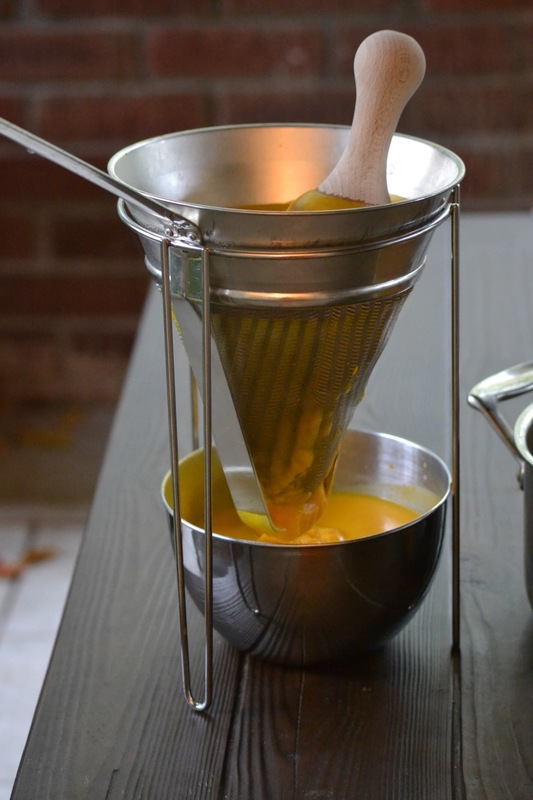 For an extra creamy soup, strain the pureed soup through a chinois or fine mesh strainer. 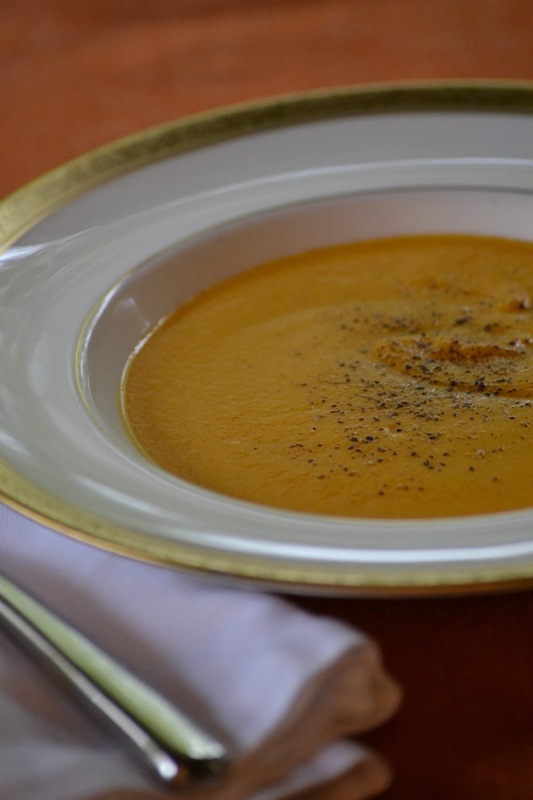 Return the soup to the stovetop and season to taste with salt and freshly ground black pepper. Enjoy!